A South American trading bloc has agreed to close its ports to ships flying the Falkland Islands flag. Mercosur, which includes Brazil, Argentina, Paraguay and Uruguay, came to the decision at a summit in the Uruguayan capital, Montevideo. But Uruguayan President Jose Mujica said British-flagged civilian ships that may supply the islands would still be allowed to use its ports. The Foreign Office said there was "no justification" for the action. 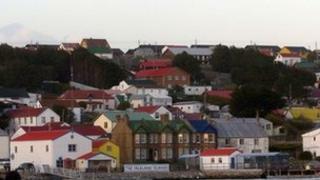 The Falklands flag is flown by 25 boats, mostly fishing vessels operated in joint ventures with Spanish companies. The Mercosur decision is the latest in a series by Latin American regional bodies designed to show solidarity with Argentina which has long claimed sovereignty over the Falkland Islands, which it calls Las Malvinas. Britain has held them since the 1830s and says their future is not negotiable. The two countries fought a brief but bloody war over the islands in 1982. Their dispute has flared again recently. Last year, Argentina accused the UK of breaking international rules by allowing oil drilling under a seabed off the islands, located in a vast area of potentially mineral-rich South Atlantic waters. Britain has also refused recent requests to re-open negotiations on the sovereignty of the Falklands. Uruguay proposed the move to close ports to Falklands-flagged vessels. Mr Mujica said: "We hold nothing against the UK. But we have a lot in favour of Argentina." He said solidarity among South America's neighbours was key to his country's foreign policy, adding: "For the moment, this means accepting that this territory is a colonial British position in our America." However, the president of the Falklands Chamber of Commerce, Roger Spink, told the BBC that they were a small community, and felt increasingly under blockade. "If we were Palestine, the European Union would be up in arms," he said. The Foreign Office, who called on Uruguay's ambassador in London to explain the move last week, said it was discussing the developments "urgently with countries in the region". A spokesman said: "We are very concerned by this latest Argentine attempt to isolate the Falkland Islands people and damage their livelihoods, for which there is no justification. "It is not immediately clear what practical impact, if any, this statement will have, which mirrors the language already used by the Union of South American Nations in 2010. "But no-one should doubt our determination to protect the Falkland Islanders' right to determine their own political future." The Foreign Office called on Uruguay's ambassador in London to explain the move last week. The chair of the Foreign Affairs Select Committee, Richard Ottaway, said the situation was "very unsatisfactory", with the ban seeming to be a breach of international law and tensions in the region escalating. Tory MP Patrick Mercer called the ban "needlessly provocative". Media captionJan Cheek, Falkland Islands Assembly: "The aim is to force the UK and the Falklands to the negotiating table"
Shadow foreign minister John Spellar said: "While this looks like a bit of a flag-waving gesture, Argentina should be in no doubt of the united determination of all parties in the United Kingdom to protect the Falkland Islanders' right to determine their own future." But former Foreign Office minister Denis MacShane said the "hostile action" was aimed at London, not the Falklands, and blamed the coalition for weakening Britain's international standing. The Labour MP said: "South American leaders know that Britain has fewer friends than ever before because of David Cameron's isolationist approach in Europe and the indifference to the Obama administration as most cabinet members are close to US neo-Cons. "Brazil and other countries know that thanks to Liam Fox's defence cuts, the UK no longer has aircraft carrier capability so British maritime power projection has been fatally weakened by the government." Argentina's President Cristina Fernandez de Kirchner, who took over the presidency of the trade bloc from Mr Mujica, thanked her fellow presidents for the show of support. Delivering a speech to the summit, she said: "Malvinas is not an Argentine cause, it is a global cause, because in the Malvinas they are taking our oil and fishing resources. "And when there is need for more resources, those who are strong are going to look for them wherever and however they can." British companies are exploring for oil in the waters surrounding the islands, which are 400 nautical miles from the Argentine coast.